1. This publication, Air Plotting Manual, is issued for the information and guidance of commissioned, warrant, and enlisted personnel to provide a standard basis of information relative to air plotting in the United States Fleet. 2. This publication is CONFIDENTIAL [Declassified] non-registered, and shall be handled, stowed and transported as prescribed in Article 76, U.S. Navy Regulations, 1920. When no longer required for use it shall be destroyed by burning; no report of destruction is necessary. 3. While the classification of the publication is necessarily CONFIDENTIAL [Declassified], Commanding Officers are urged to make certain that the book is available to all CIC and radar personnel whose duties require access to the information contained therein. 4. Requests for this publication shall be made to Headquarters, Commander in Chief, United States Fleet, (Readiness Division). Note: Numbers in parentheses indicate number of copies sent to each addressee. 3. Raid and Dead Reckoning Exercises. This manual has been prepared with the intention of including in one handbook a standardized air plotting procedure utilizing uniform abbreviations, symbols and methods. 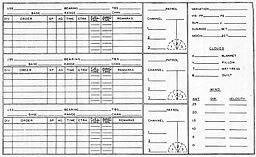 This standardization has been considered necessary in order to have air plotting easily readable and understandable to all interested personnel. To achieve this purpose, the material herein is, to a large extent, the adoption of current existing procedures and practices. Basic doctrines on this subject as outlined in USF 10A, USF 70A, etc., have been adhered to. An appendix of problem material has been provided to assist in the training of personnel. The objective of air plotting is to present an accurate, up-to-the-minute picture of the position and track of all aircraft in the surrounding area. To track interceptions of attacking enemy aircraft as an aid in fighter direction. To fix and evaluate unidentified air contacts. To track search, attack, observation, rescue, and other friendly planes. To assist in homing lost planes. 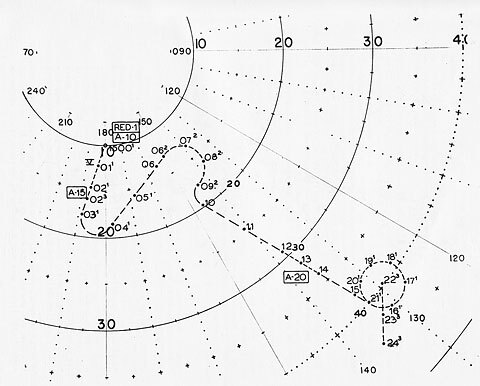 Navy air plotting is done in a polar coordinate chart. The coordinates of this chart consist of bearing lines radiating from the center, and a series of concentric circles having a uniform spacing, representing range in nautical miles. This type of chart is necessary since the point of reference on moving vessels is constantly changing. These charts are mounted either horizontally or vertically and are surfaced with either a transparent plastic material or tracing paper. Grease pencils are generally employed on transparent plastic surfaces and lead pencils on tracing paper. The use of grease pencils requires experimentation to discover the colors adapted to the individual type of plot. Reds and yellows show prominently on edge-lighted boards. Blacks, blues and reds show prominently on horizontal boards with either sub lighting or top lighting. Lint-free rags and commercial window cleaning fluids are most desirable for erasures on transparent plastic plotting surfaces. 1300. PLOTTING SYMBOLS AND ABBREVIATIONS. 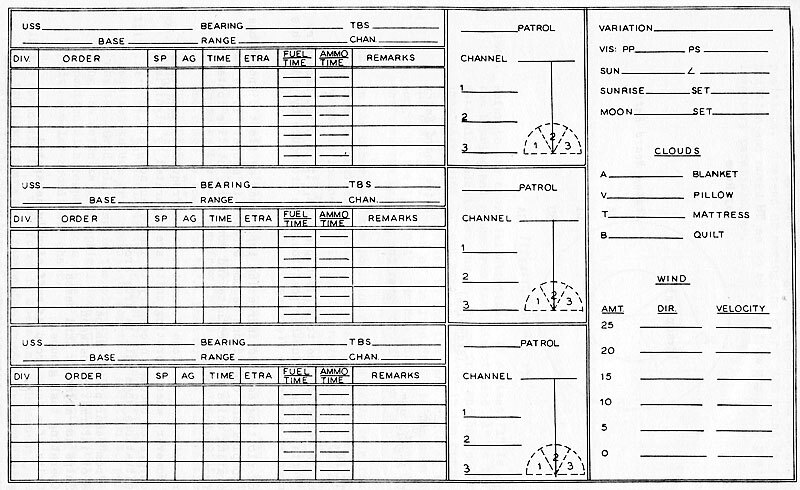 Listed below are symbols and abbreviations used in air plotting. Their use will be demonstrated in subsequent paragraphs and illustrations. It is essential that plotters be completely familiar with these symbols and their various uses. X Bandit (identified enemy aircraft). Merged plot (friendlies and bogies at same location). Emergency IFF (approximately twice the size of the friendly symbol). 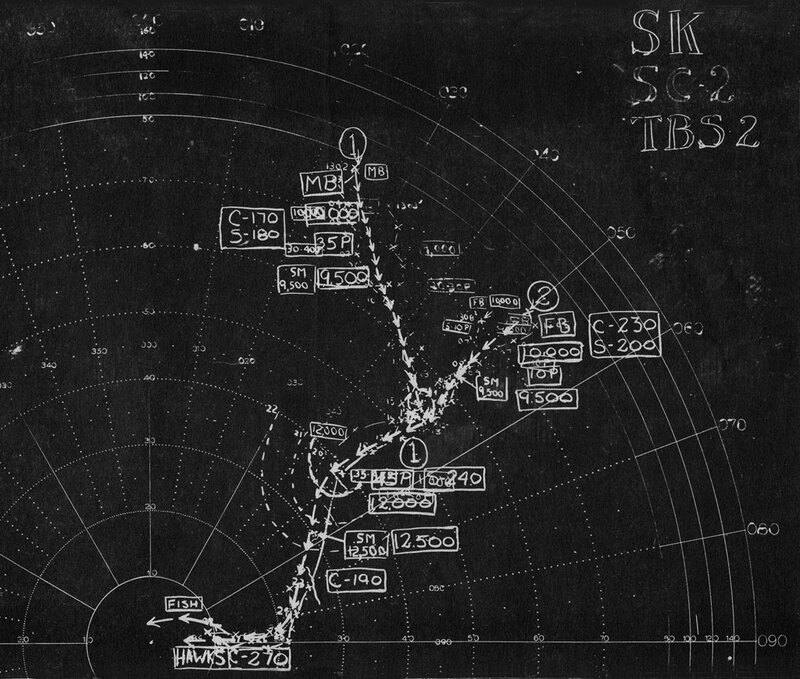 Dead Reckoned positions of controlled aircraft. #3 Code number of IFF (Figure placed beside friendly track at point of code identification). Sun or moon (Figure in symbol represents angle of elevation). Abbreviations. (Appear in information boxes along plotted track). MB Many Bogies (over 10). A Angels (Altitude in thousands of feet). The track of an air contact is developed primarily from radar reports. these reports are transmitted to the plotter in terms of bearing and range. The radar operator also reports such additional information as type, composition, and altitude. Bearing errors of as much as plus or minus 3° are encountered in all search radars. That is, consecturive radar readings may vary as much as 6°. This results in the track of a contact, moving on a straight course, often appearing on the plot as a zig-zag line. When a radar fix is received, it is (1) placed on the polar coordinate chart, (2) labeled with the time the plot was received and (3) connected to the previous plot with a straight line. (For neatness and readability it is best that space be left between the plot and the end of the line). The time is recorded in two digits which represent the minutes past the hour. The only exceptions to this are (1) the first of a series of connected plots and (2) the first plot in a new hour. Exponent "1" - 7½ seconds to 22½ seconds. Exponent "2" - 22½ seconds to 37½ seconds. Exponent "3" - 37½ seconds to 52½ seconds. No exponent - 52½ seconds to 7½ seconds (represents the even minute). should a raid split at a distance of less than thirty miles, the legs are considered part of the original raid and are designated as parts A, B, C, etc. of that raid. When possible, the direction of movement of a bogey is indicated at the initial plot by an arrow pointing either toward or away from the center of the board. Successive plots will then substantiate and more accurately show the direction or course of the bogey. As shown above, when such information as size, altitude, course, speed or type of raid becomes known, it is placed in oblong boxes along the bogey track and, when possible, on the opposite side from the time recorded. Ordinarily, each item of information is placed in a separate box. However, the box containing the rough estimate of bogey size made on the initial contact report is made sufficiently large to accommodate the first estimate of the specific number planes in the contact. This number in the estimate is subsequently inserted in the box. If a different estimate is made later, it is placed in a separate box beside the plot on the track with which the estimate was made and the letter "P" is placed in the box to show that it is an estimate of the number of planes in the formation. All boxes and the times are placed so as to face directly the officer using the information and should be large enough to be easily readable. This frequently requires the plotter to plot and print upside down or at an angle. A minimum of three plots is necessary to determine an initial course and speed and at least two plots are needed to determine a change in course or speed. The only exception is within twenty miles, when one plot is considered to indicate a change. Changes in course and speed of less than 30° or 30p knots are, normally, not to be recorded. However, the altitude of a raid is indicated by figures showing the altitude in feet (e.g.) A raid at eighteen thousand feet is indicated by the 18,000 placed in a box. The altitude of friendly planes is indicated by the letter "A" (for angels) and the altitude in thousands of feet (e.g. 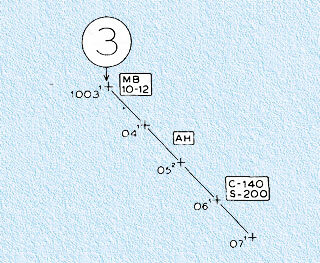 friendly planes are indicated by "A18" placed in a box beside the friendly or dead reckoned track at the point where the planes reached that altitude. A smooth imaginary line drawn through the plots in the direction which the track is taking is considered to be the course. The speed can be determined by laying off a nomogram the distance made good for 3 or more plots. Another rapid way to calculate speed is multiply by 20 the distance made good in three minutes. When a closing or crossing raid fades, the possible position of the raid at any minute is shown by a series of concentric, dashed semi-circles known as Estimated Position Arcs. (EPA). The origin of these arcs is the last known "fix" of the raid. An arc will be plotted every whole minute from the time of this fix until another fix is obtained, at which time the two "fixes" will be connected by a solid line. The radius of the EPA is the distance the bogey would travel as known by its already determined speed. The EPA is a semi-circle, positioned toward the base so that the two ends fall at the same range as the last plot. When the operator advises that the bogey has faded, a wavy line ( ) is placed after the last plot given, and when the bogey reappears, another fade line is placed just before this new plot. 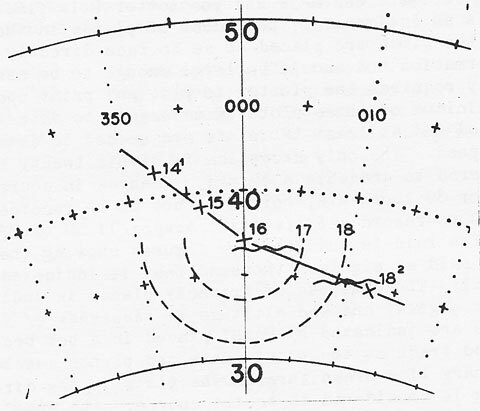 These fade lines are approximately one half inch long and should be parallel to a tangent of the range circles so that the person computing the altitude can tell at a glance the range at which the raid faded and at which it reappeared. In the event the operator simply fails to report on the raid but does not announce a fade, the fade lines are omitted and only the EPA's are drawn in. Friendly contacts are plotted, timed and connected in the same manner as bogey contacts. The code of IFF shown by a friendly contact is placed beside the track at the point where it is reported by the operator. The symbol should be of prominent size and is not enclosed in a box. No raid designations, fader lines or Estimated Position Arcs are used. Other information (course, speed, altitude, etc.) will be included if directed. As a supplement to radar reports, a procedure for tracking controlled friendly aircraft is employed. This procedure is known as dead reckoning. 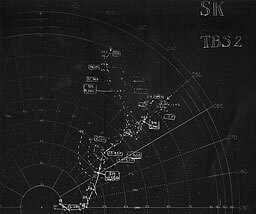 It is used in order to keep a more accurate and current track of these aircraft than could be obtained from radar reports alone. It is necessitated because of fades, land echoes, jamming, radar interference, failure of operators to report, and many other factors that might result in an incomplete track from radar reports. The D.R. 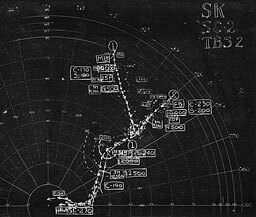 position is plotted every minute by means of a large dot ( ) placed along the course the aircraft have been ordered to fly. These dots are connected by a dashed line, each dash representing a fifteen second time interval. As a radar contact is obtained on the fighters, it is plotted as a friendly plot (O), and the subsequent DR track is continued from this plot. Subsequent plots are connected by solid lines, and, when time permits, the obsolete DR track may be erased. Times are recorded in the same manner as above. When a change of course is given to the fighters by the Intercept Officer, the DR plotter continues the original DR track for 15 seconds before executing the order on the plot. This delay is to compensate for the time lag between the order and its execution. 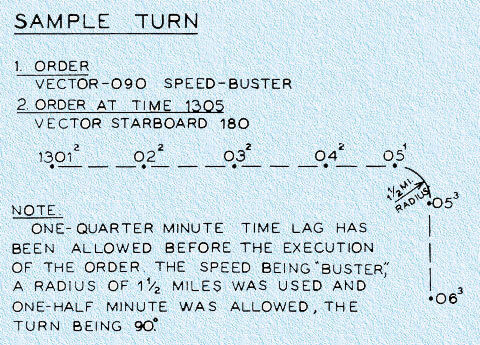 However, should the pilot fail to wilco ["will comply"] the order within this 15 second period, the DR plotter will continue plotting on the previous track until certain that the order has been received. SAunter = Lowest speed possible without losing height. LIner = Economical cruising speed. BUster = Normal full speed. GAte = Maximum possible speed. These speeds vary with the type of aircraft employed. Hence the dead reckoning plotter must be familiar with the performance of the planes with which he is working. The following figures, which approximate the performance of our present first line fighting planes, will be used for illustrative purposes in this manual. SAunter = 150 knots or 2½ miles per minute over the ground. LIner = 210 knots or 3½ miles per minute over the ground. BUster = 240 knots or 4 miles per minute over the ground. 300 knots = or 5 miles per minute over the ground. If no speed order is given, the Dead Reckoning plotter will assume that the planes will fly at LIner. The radii of the turns to be used in Dead Reckoning are dependent upon the altitude and speed of the planes. STANDARD TURNS: Radii and time to turn 180°. LIner = 1¼ miles 1 minute. BUster = 1½ miles 1 minute. GAte = 1¾ miles 1 minute. HARD TURNS: Radii and time to turn 180°. SAunter = ¼ mile ½ minute. LIner = ¼ mile ½ minute. BUster = ½ mile ½ minute. GAte = ½ mile ½ minute. A 90° turn takes one-half of the above listed times, a 45° turn one-quarter, etc. Turns of less than 45 degrees are not timed and no turning circle is used. Turns greater than 45° are figured to the nearest 45 degrees. For example: A 60° turn is timed as a 45° turn and a 70° turn is timed as a 90° turn. The simple orbit is dead reckoned around one complete circumference at SAunter speed. The radius is 3 miles (6 miles in diameter) and consumes approximately six minutes. After one complete orbit, dead reckoning starts from the center of the orbit. 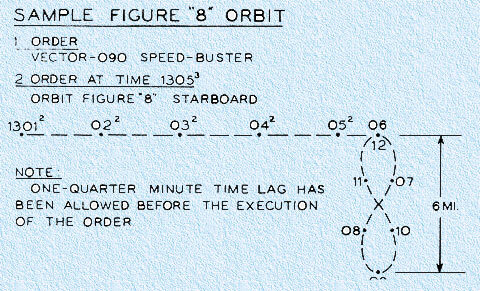 The figure of eight orbit is dead reckoned through one complete figure, also at SAunter speed, and requires six minutes to complete. The long axis of a figure of eight orbit is approximately six miles and is perpendicular to the previous line of travel. 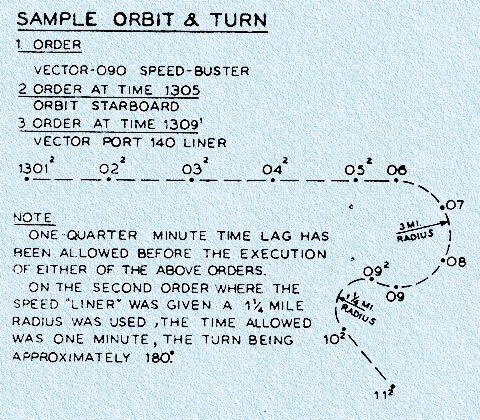 Both types of orbit can be directly across the line of travel, entirely to the right or entirely to the left. After one complete orbit, dead reckoning starts from the center of the orbit. When dead reckoning planes that are climbing, the track is advanced at SAunter speed. When dead reckoning planes that are descending, the track is advanced at GAte sped. A normal rate of climb is 2000 feet per minute. When the order "scramble gate" is given, the rate of climb is 2500 feet per minute, but the plane's track is still advanced at Saunter speed. 5000 feet per minute is a normal rate of descent. Only the following information is placed along the DR track: time, angels, and the designation of the friendlies. The word "Vector" is an order to friendly planes to follow the magnetic heading indicated. "Steer" is an order to return to base by the magnetic heading indicated. Radar reports are given as true bearing, but the compass of the friendly plane is affected by magnetic variation, and this variation must be taken into consideration when the order to vector is given. The rule is "Magnetic Heading plus easterly variation yields true heading; magnetic heading minus westerly variation yields true heading." For example, in an area of 10° westerly variation, if Black One is given an order "Vector 100°", the Dead Reckoning Plotter will D.R. a course of 090°. Conversely, in area of 10° easterly variation, he will D.R. a course of 100°. Remember the phrase "true-right-East." On carriers and certain other large ships, a special type of edge-lighted vertical plot is installed in the CIC. This plot is known as the Summary Plot. It is constructed of transparent material and is so designed that plotters work behind the board and plot on the back side. In front of the board an officer is stationed who is charged with "filtering" these plots. Filtering is the determination of the most probable position, course, speed, altitude and composition of a flight of aircraft. This information is obtained from radars, lookouts and all other sources. It is for the use of Command, the FDO and the Intercept Officer. Filtering is done by the Radar Control Officer (RCO) on the front of the vertical display board by evaluating the information plotted on the back. In the event, however, of complete confidence in the accuracy and performance of a particular radar set, filtering is not necessarily used. The basic requisite for filtering is complete understanding by the RCO of the capabilities and limitations of his own and other radars and operators. 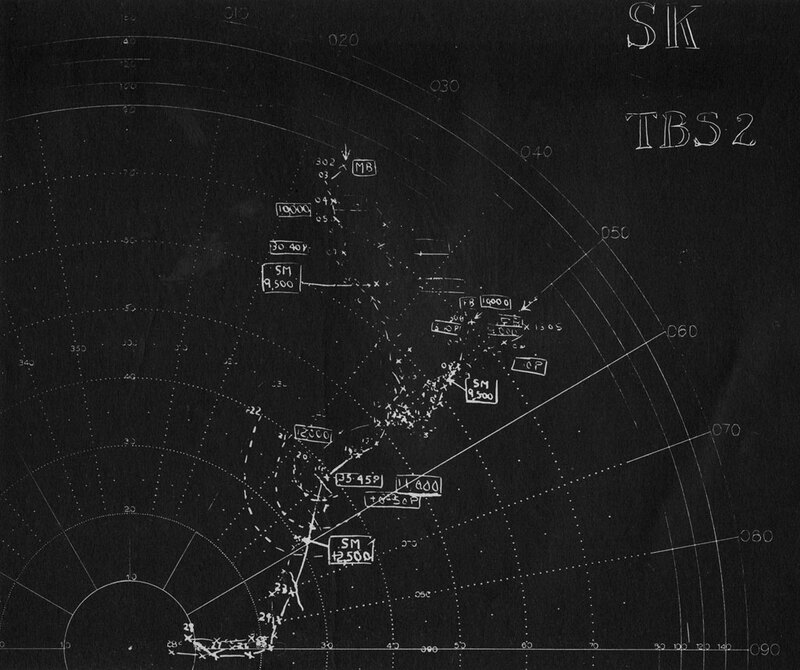 Position: Position of a raid is shown on the plot with an arrow after considering radar plots and other information. If only one radar is reporting, the track made can be determined by fairing a line between the plots. However, if more than one radar is reporting, special consideration is given to the most reliable. The time of each plot determines the true advance of position as indicated by the head of the arrow at the established speed. Due to the time lag from scope to RCO the position of the arrow should lead the plot by a distance equal to speed times lag. One arrow per minute is drawn. Course: The direction of the arrow indicates the course and is determined by study of positions. Course of the raid is shown beside the track in a box, and all pronounced changes are recorded immediately. Speed: Time and distance between positions indicate speed of flight, which is shown along with course. Generally, planes fly in a straight line at constant speed for reasonable intervals of time, but if two plots in a closing raid indicate a serious reduction of speed, it is likely that the flight has changed course and a bearing error introduced. The next plot should confirm this -- if not, speed has changed. A large increase in speed indicates diving. Conversely, a large decrease indicates climbing. In applying this reasoning to crossing raids, the error in bearing determination is markedly greater than in rage determination, so that apparent changes in speed are sometimes misleading and previously determined speeds are usually more reliable. estimate should be used if there is a difference among several radars. Visual reports are always given greater weight than estimates from fade charts. Number of Planes: This information is shown in its own box. Radar operators must pass frequent size reports to detect splits. If two or more flights are close together, size is given in each report so as to determine whether flights are converging, cross, parallel, or trailing. If reports from several radars vary, it is safer to use the higher estimates, and the RCO should inform operators of the number of planes in any known flight. The type of planes in a contact can often be deduced by intelligence, a knowledge of enemy performance, tactics or procedure. In cases of heavy traffic, hostile raids, unidentified flights, emergency signals, and friendly planes are filtered in this priority. The plotting on the back of the Summary Plot conforms with the plotting procedure set forth earlier in the manual. However, the raid designation circle is omitted, as are courses and speeds, unless specifically requested by the RCO. This plotting is done solely for the benefit of the RCO who is standing in front of the board. The plotters must become proficient in writing backwards. Grease pencils that do not show at a distance are used so as to be visible only to the RCO. On the other hand, the RCO uses a grease pencil that shows prominently. Yellow and red are recommended. In the event that there is no information on a raid from any source, the RCO constructs EPAs. The RCO plots but does not DR the friendly track. A merged plot is shown as the friendly symbol placed inside the arrowhead. For example of filtering procedure and symbols, note illustration #14. 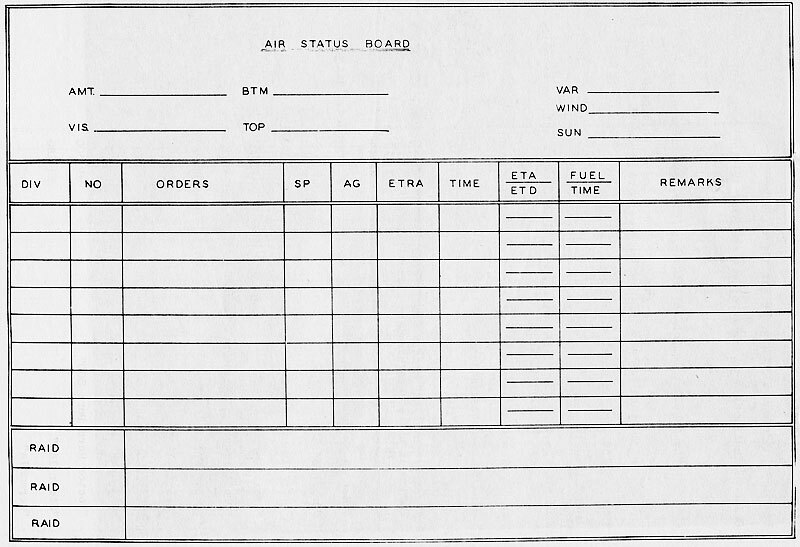 A status board is used to assist the Fighter Director in keeping track of his planes. It is a display of all information on the aircraft being controlled. 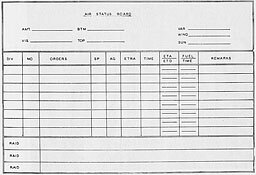 The status board includes all orders given to the fighters, and for this reason is of prime importance to the Dead Reckoning Plotter. The specific items on the status board with which the Dead Reckoning Plotter is concerned are: (See Illustration #15 and 16). Div. Division call, e.g. "Black 1". SP Speed, e.g. "BU" (Buster). AG The angels to which the fighters have been ordered. ETRA "Estimated Time Reach Angels" -- The time at which the fighters will reach the angels to which they have been ordered. Time The time at which the order is given. Wind The direction from which the wind is blowing and the velocity of the wind in knots. Sun The bearing and elevation of the sun (or moon). A great variety or orders are entered in the order column. The more common of these have standard abbreviations. "Orbit Point King" OR "K"
When a contact is reported true to a given position, it is often necessary to plot this contact true to another position. The procedure by which this is done is known as conversion plotting. This method of plotting assumes increasing importance as fleet dispositions become more complex and operations become broader in scope. It is employed by operating units to coordinate and more fully utilize contact information from several sources. Reports from radar picket ships. Ships and adjacent land bases. Units of a task group if sufficiently separated. Regardless of the situation, the method of conversion employed remains essentially the same. The simplest and quickest technique for converting is one which is considered sufficiently accurate for the plotting of air contacts, is the parallelogram or "eye" method. In its essentials, it involves using one polar chart to measure bearings and ranges from all different reporting positions. instead of moving the chart, the point is read from one position and moved so as to be read from any other position by use of an imaginary parallelogram. Refer to the above illustration. 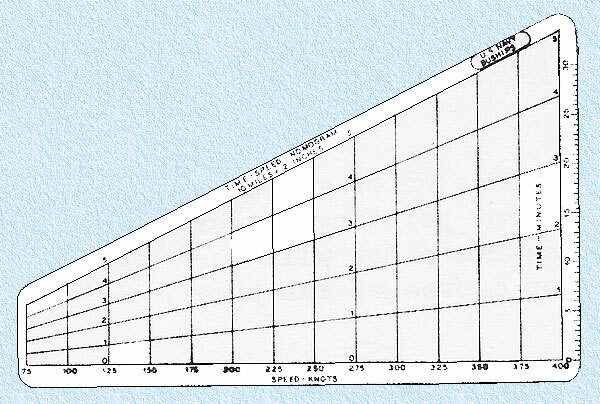 If contact "X" is plotted on the chart, the bearing and range from the ship of base "A" is the line "A-X". To determine quickly bearing and range from another position, "B", take an imaginary point "C" and move it from "X" in the opposite direction from "B" ("X-C"), but parallel to and the same length as the line "A-B". Then the bearing and length of the line "A-C" is the same as the bearing and length of the line "B-X". Hence, point "C" is read directly from the chart as the bearing and range of "X" from "B". On the other hand, the position may originally be given from "B". In this case, an imaginary point on our chart, "C", representing the bearing and range, is indicated. It is then moved parallel to "B-A" again, and the same length as "B-A" but, in the direction of "A" to "B". The contact is then plotted as "X". This position represents the bearing and range from "A". A method is indicated. To convert a position, "X", from "A" to "B", place a point, "C", from "X" the distance and direction of "B" to "A". Then read "C" from the chart. The point may then be erased. Conversely, to convert a position from "B" to "A", place a point, "C", for bearing and range as read from "B". Then move in the direction from "A" to "B" and plot as "X". A times, a particularly during amphibious operations, Naval personnel are required to use grid coordinate charts in addition to polar coordinate charts. Grid plotting is the plotting of reports on a map or chart showing the definite geographical location of a contact rather than the relative location with respect to a ship or the center of a task force as is the case with a polar coordinate chart. from land based sources, or receiving reports from great distances and varied locations, the plotting of reports with respect to geographical location has its advantages and is considered preferable. All Allied land based forces do their plotting on grids. Hence, in joint operations with land based forces Naval personnel must be prepared to use grid plotting. Reports of positions by latitude and longitude are, in a sense, grid plots. However, grid plotting is the use of special charts which have the earth's surface subdivided into a series of lettered squares which, in turn, are subdivided into numbered coordinates representing certain areas. The subdivisions mentioned above (except in a few special cases) are located with respect to standard latitudes and longitudes. They provide an easy, rapid and clear means of accurately locating small areas on the earth's surface. For security purposes the grid lends itself readily to coding. The larger grids me be constructed on any type projection--Mercator, Lambert Conformal Polyconic, or Gnomonic. The Mercator is most accurate for use in the equatorial latitudes, and the Lambert Conformal for the temperate latitudes. Mafog (Mediterranean Area Fighter Operations Grid). Seafog (Southeast Asiatic Fighter Operations Grid). This manual will deal primarily with the construction of the JAN Grid. Other grids may be encountered depending on the location of operations. Regardless of the type of grid, the use is the same. The JAN grid locates the borders of the lettered grids or squares with respect to standard latitude and longitude divisions and covers the entire earth's surface. 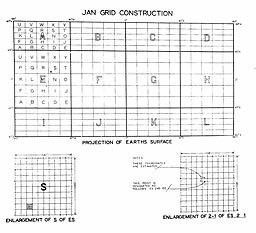 A reference to the construction of the JAN grid is found in USF 70(A) appendix E.
A diagrammatic explanation of the JAN grid is presented in illustration #18. 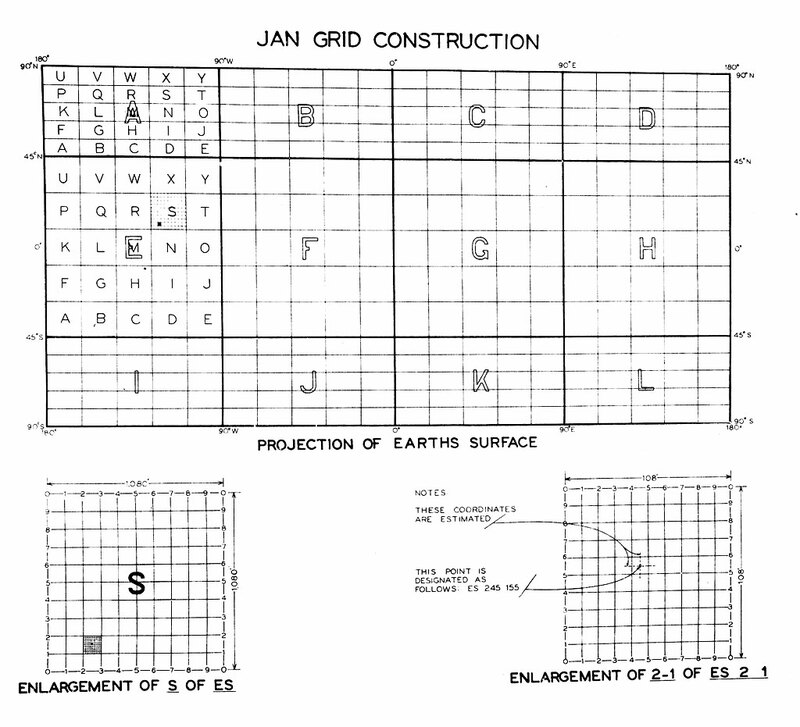 Reference to the illustration of JAN grid construction will show that the entire earth's surface is subdivided into twelve major letter subdivision. Each of these subdivisions is, in turn, subdivided into twenty-five lettered subdivisions. Each small lettered subdivision is, in turn, subdivided by numbered coordinates into ten equal spaces in latitude and longitude. Each of these numbered spaces is in turn subdivided into ten equal spaces of latitude and longitude. These letter subdivision are subdivided into ten small subdivisions by estimation. thousandths the distance north from the south boundary line of the smaller lettered subdivision "S". Normally, only the one letter is called in indicating plots, since each smaller lettered subdivision in equatorial latitudes is, roughly speaking, 1000 nautical miles square, and above 45° north and 45 ° south latitudes about 500 nautical miles square. The exception is when the area being plotted overlaps two adjacent major lettered subdivision. Plotting accuracy is to within approximately one nautical mile in the equatorial latitudes, and to within approximately one half nautical mile in the middle latitudes. In designating locations, a rule of thumb is to call the lettered subdivision, then read right and up with the numbers, i.e. read from left to right all numbers indicating the east-west position and then read from bottom to top all numbers locating the north-south position. 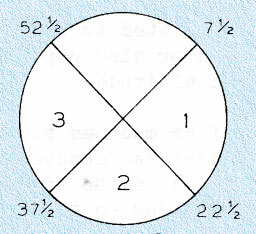 For air plotting, six numbers are always used, the first three locate the east-west position, the last three locate the north-south position. The symbols and procedure for plotting on a grid map are the same as those used for plotting on a polar coordinate chart. Conversion of plots from a grid map to a polar coordinate chart, or vice-versa, is easily accomplished by superimposing a polar chart on a grid map, locating the polar center at the correct geographical location on the map. Another method is to use a parallel motion protractor and project the bearing and distance of a plot form your geographical location on the grid map. In conversion plotting from grids to polar, or vice-versa, the polar coordinate chart and the grid chart are drawn to the same scale. Snooper*. Straight-In Orbit And Split. * This problem can be used to show snooper sighting us and carrier planes coming out to attack. Takes 41 minutes. Can be shortened by omitting first 10-15 plots or calling friendly plots from close in back out and having interceptions. Change of Speed and Angels only. No variation. D.R. one division. Change of speed and Angels only. No variation. D.R. one division. Turns and orbits. No variation. D.R. one division. No variation. D.R. one division. Orbits and Turns. Variation 11° W.
D.R. two divisions. No variation. D.R. two divisionss. No variation. D.R. two divisions. Variation 8° E.
D.R. two divisions. Variation 10° E.
Plot one raid, Dead Reckon one division. No variation. Black 1, OR AS, A 8. 002 Hello Blk. 1, this is Blk. Base. Vc 260 BU A 8. Over. This is Blk. 1, Wilco Vc 260 BU A 8. Out. 013 Bogey 264-64 15-20 P.
This is Blk. Base. Roger. Out. 032 Designate raid bearing 264 - Raid 1. 043 Bogey 268-56 at 10000. 05 Hello Blk. 1, this is Blk. Base. A 12. Over. This is Blk. 1. Wilco A 12. Out. 071 Hello Blk. Base, this is Blk. 1. Level at A 12. Over. 09 Hello Blk. 1, this is Blk. Base. Vc P 250. This is Blk. 1. Wilco Vc P 250. Out. 103 Hello Blk. 1, this is Blk. Base. Vc S 070. Over. This is Blk. 1. Wilco Vx S 070. Out. 12 Tallyho. Blk. 1-1, 8 2, down, 2 miles, 15 B at 1000. Over. Plot one raid. Dead reckon one division. Variation 10° W.
Red 1, OR AS, A 20. 01 Hello Red 1, this is Red Base. Vc 230 LI A 20. Over. This is Red 1. Wilco Vc 230 LI A 20. Out. 02 This is Redd 1. On Vc Directly above base. Over. This is Red Base. Roger. Out. 073 Hello Red 1. Vc P 150 GA. Over. This is Red 1. Wilco Vc 150 GA. Out. 111 Hello Red 1, this is Red Base. Vc P 010. Over. This is Red 1. Wilco Vc P 010. Out. 122 Tallyho. This is Red 1-4. 5 B, 10 R, down, 5 Q, 3 miles at 18000. Over. Green 1, OR AS, A 20. 012 Hello Green 1, this is Green Base. Vc 130 BU A 10. Over. 013 This is Green 1. Wilco Vc 130 BU A 10. Out. 013 This is Green 1. On Vc 2 miles SE of base. Over. This is Green Base. Roger. Out. 04 This is Green 1. Level at A 10. Out. 061 Hello Green 1, this is Green Base. P 30. Over. This is Green 1. Wilco P 30. Out. 091 Hello Green 1. Vc P 010. Over. This is Green 1. Wilco Vc P 010. Out. 111 Tallyho. This is Green 1-2. 1 Betty, 3 Q down, 2 miles at 8000. Over. 131 Hello Green Base, this is Green 1. Grand Slam, 1 Betty, request homing. Over. This is Green Base, SR 280. Over. This is Green 1. Wilco SR 280. Out. Gold 1, OR AS, A 2. 02 Hello Gold 1, this is Gold Basxe. Vc 080 LI A 14. Over. This is Gold 1. Wilco Vc 080 LI A 14. Out. 03 Hello Gold Base, this is Gold 1. On vector 2 miles NE of Base A 3. Over. This is Gold Base. Roger. Out. 053 Hello Gold 1, this is Gold Base. P 20 Scramble GA A 14. Over. This is Gold 1. Wilco P 20 A 14. Am now at A 9. Over. 08 This is Gold 1. Level at A 14. Over. 103 Hello Gold 1. Vc S 100 BU. Over. This is Gold 1. Wilco Vc S 100 BU. Out. 133 Hello Gold 1. Vc P 280. Over. This is Gold 1. Wilco Vc P 280. Out. 15 Tallyho. This is Gold 1-4. 2 Bettys, 3 Q down, 1½ miles, at 12000. Over. 193 Hello Gold Base, this is Gold 1. Grand Slam, 2 Bettys. Request homing. Over. 193 This is Gold Base. SR 230 LI. Over. 20 This is Gold 1. Wilco SR 230 LI. Out. Black 1, OR AS, A 25. 033 This is Black 1. On vector 5 miles NE of base. 143 Tallyho. This is Black 1-4, 3 Q down, 2 miles, 15 F, 3 R, at 12000. 211 This is Black Base. SR 195. Gray 1, OR AS, A 5. 00 356-70 L B closing. 011 Hello Gray 1. This is Gray Base. Vc 000 GA. Over. This is Gray 1. Wilco Vc 000 GA. Out. 013 This is Gray 1. On vector 5 miles N of base. Out. 033 Hello Gray 1. A 10. Over. This is Gray 1. Wilco A 10. Out. 083 Hello Gray 1. This is Gray Base. OR P. Over. This is Gray 1. Wilco OR P. Out. 103 Hello Gray 1. Vc H P 000 GA. Over. This is Gray 1. Wilco Vc H P 000 GA. Out. 122 Hello Gray 1. Vc H HP 190. Over. This is Gray 1. Wilco Vc H P 190. Out. This is Gray Base. Roger. Out. 163 Hello Gray Base, This is Gray 1. Grand Slam, 1 Betty. Request homing. Over. This is Gray Base. SR 170. Over. This is Gray 1. Wilco SR 170. Out. Plot one split raid. Dead reckon one division. Variation 10° W.
Black 1, OR AS, A 11. 00 326-73 M B closing. 011 Hello Black 1. Vc 330 BU A 22. Over. This is iBlack 1. Wilco Vc 330 BU A 22. Out. 013 This is Black 1. On vector miles NW of base at A 12. Over. This is Black Base. Roger. Out. 06 This is Black 1. Level at A 22. Out. 081 Hello Black 1. Descend to A 18 GA. Over. This is Black 1. Wilco descend to A 18 GA. Out. 101 Hello Black 1, this is Black Base. Vc H P 200 GA. Over. This is Black 1. Wilco Vc H P 200 GA. Out. 12 Tallyho. This is Black 104. 5 F, 5 R, 5 H, 5 Q 3, down, at 16000. Over. 152 305-25 Bogey only. (Raid is splitting). White 1, OR AS, A 16. 011 Hello White 1. Vc 290 BU A 27. Over. This is White 1. Wilco Vc 290 BU A 27. Out. 013 Hello White Base, this is White 1. Steady 2 miles west of base. Out. 053 Hello White 1. P 20. Over. 072 Hello White Base, this is White 1. Level at A 27. Out. 113 Hello White 1. Vc P 210. Over. This is White 1. Wilco VC P 210. Out. 132 Hello White 1. OR P. Over. This is White 1. Wilco OR P. Out. 201 Hello White 1. Vc P 120 GA. Over. This is White 1, Wilco Vc P 120 GA. Out. 212 Hello White 1. Vc P 070 SA. Over. This is White 1. Wilco Vc P 070 SA. Out. 242 Tallyho. This is White 1-4. 5 B, 2 R, 5 Q, down at 25000. Over. This is White Base. Roger. Out.